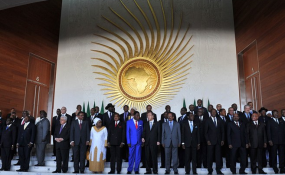 Heads of States at the AU Summit in Addis Ababa (file photo). It's not easy to get a sitting president to leave office. In some cases, corruption, violence, and institutional inertia have conspired to keep some African presidents in office for decades. So, elections are held, but there is rarely a surprise. Hence why today's annulment of the election victory of President Uhuru Kenyatta by Kenya's supreme court is such a landmark moment. But in the last three years some significant shifts seem to be occurring. A quick survey of the status of incumbency across the continent suggests a growing political maturity - not in African voters, who have always turned out in big numbers to make their voices heard - but in African politicians who are increasingly willing to accept defeat. It began in Nigeria in 2015 when Muhammadu Buhari beat then-president Goodluck Jonathan in a hotly contested poll. Given Nigeria's chequered political history there was real apprehension over whether Jonathan would concede. But he not only conceded, but congratulated Buhari for his win. Then John Dramini Mahama became Ghana's first one-term president. He happily handed over to Nana Akufo-Addo in 2017, that man he defeated in the 2012 vote. And then in Somalia, Mohamed Farmaajo took over from Hassan Sheikh Mahmood in February this year in a peaceful transition that defied the logic of the country's ongoing civil war. Of course, it's not all been smooth sailing. In Burundi, Pierre Nkurunziza's tampering with the constitution to stay in office has thrown that country into chaos. In Gabon, Omar Ali Bongo needed one of those last-minute 99 percent turnouts in his home constituencies in order to secure his stay in power. In Uganda, perpetual oppositionist Kizza Bessigye has been repeatedly detained and harassed, while Diane Rwigara, one of Kagame's challengers, has lately gone missing. That's what makes the news from Kenya so astonishing, and the court's judges such unlikely heroes. The commission that runs the elections had declared incumbent Kenyatta the winner of the 8 August election - despite loud protest by the opposition party, NASA. The opposition insisted that though the vote had been free and fair, the tallying of the results had been fiddled with. But just as importantly it has also been a dramatic assertion of the judiciary's independence. For the long game of establishing democracy and the rule of law in Kenya, the supreme court's decision was a good one. It restored confidence in a body that Kenyans routinely place second or third on their list of the least trustworthy institutions. To date, electoral commissions have been the focus of efforts to check the power of incumbents, and while this proved enough in Ghana, Nigeria, and Gambia, in many cases it's simply not enough. Today's decision in Kenya adds another player to the game, which one can only hope inspires more judiciaries on the continent. Nanjala Nyabola is a Nairobi-based writer and political analyst. Copyright © 2017 IRIN. All rights reserved. Distributed by AllAfrica Global Media (allAfrica.com). To contact the copyright holder directly for corrections — or for permission to republish or make other authorized use of this material, click here.